Rectangle Address Plaque with House Number - - solid cast aluminum personalized address number sign. 12"W x 6"H. Wall mount. Made in the USA. Includes one line of personalization, typically the street number. Solid cast aluminum plaque comes in 16 plaque colors with aluminum characters and border. Powder coating was developed to out-perform paint, especially in the coastal regions where salt has proven to be the number one enemy. Dimensions: 12"W x 6"H"; weighs 2 pounds. Custom made to order. Please allow 4 to 5 weeks for delivery. 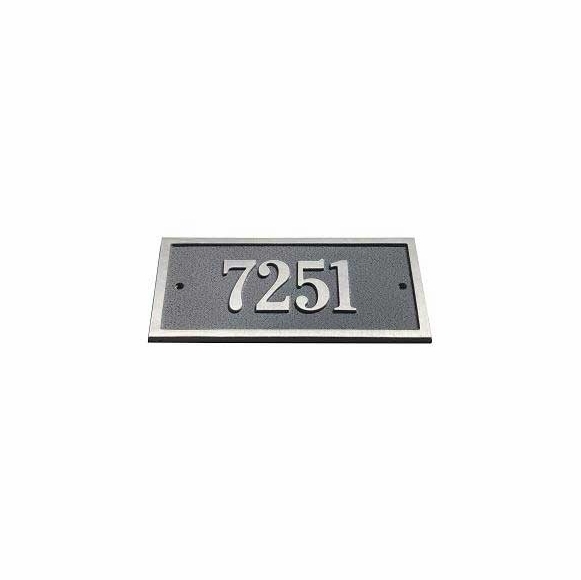 Sleek and contemporary rectangle address plaque holds a house number with up to five digits. Solid cast aluminum.